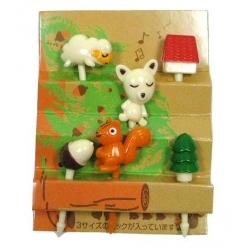 It contains 6 food picks, 3D, for bento lunch decoration, designed as sheep, squirrel, tree, house, dog, and more. They are very cute. 6 food picks, 3D, for bento lunch decoration, designed as sheep, rabbit, mushroom, dog, and bear. They are very cute. 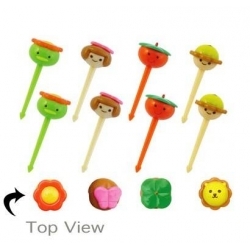 This animal food pick set is a great addition to a complete lunch box. It contains 10 picks, designed as Giraffe, dog, cat, bear, and monkey. They are very cute, great for your bento decoration. This food pick set is a great addition to a complete lunch or bento. It contains 8 picks, designed as cute little faces. They are very cute. 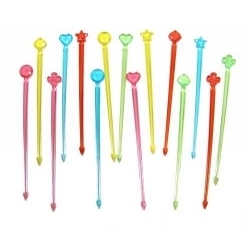 This animal food pick set is a great addition to a complete lunch. It contains 6 picks, designed as Giraffe, dog, cat, bear, and monkey. They are very cute.